Spring is definitely in the air when the market offers the first Soft Shell Crabs of the season. I’v often wondered what the excitement about these Crabs is all about. Is it the true sign of Spring? Or the fact that now is this time of the year that the shell of the blue crab is in its molted state and edible? Whatever the reason, they’re one of Cathie top favorite delicacies. 1. Heat the Vegetable Oil to 300 degrees in a deep pot or deep fryer. 2.Clean the crabs with water & blot them dry with paper towels. Coat the Crabs with the Egg & then the seasoned Panko. Make sure the Crabs are well-coated before you fry them. 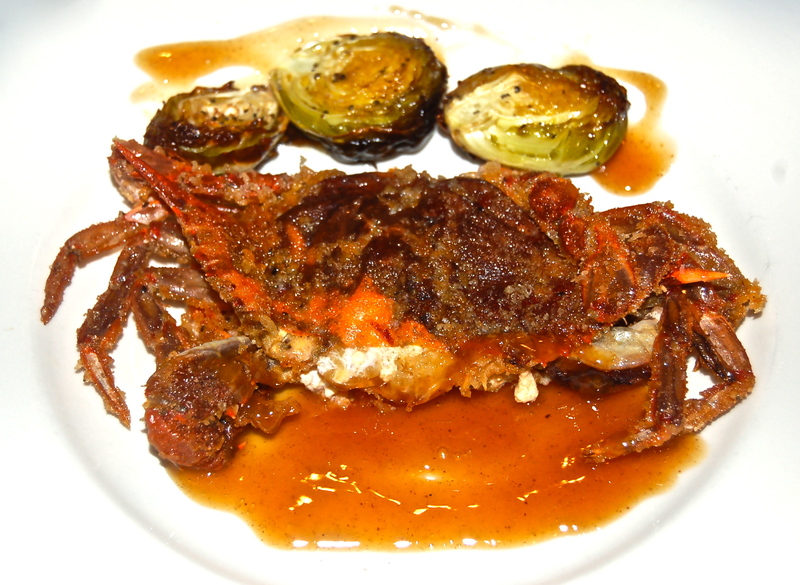 3.Deep fry the Crabs until their shell turns red & the Panko becomes golden brown. About 2-1/2 minutes a side. 4. Remove to paper towels & prepare to plate.